I was born en caul & double crowned. My grandmother first taught me the 'game of tarot' using a regular set of cards. Through my teen years I studied runes, but came back to tarot as a young woman. I've been reading tarot spreads for over 35 years now, albeit privately. I emerged from the broom closet in May '15 two years after taking early retirement & settling in Thailand. This is my first public offering of my services. I am able to maintain my energy & focus through set hours due to my strong foundations and beliefs in action, skills honed & qualifying me as a practitioner of Holistic Tarot Counseling. I have an MA in Human Development & Psychological Counseling (completed 2004, ASU Boone, NC) I am an eclectic neutral practitioner of earth science/magik & solar metaphysics. I grew up moving a lot. I've lived in Mississippi, Alabama, Louisiana, Texas born, Georgia, & North Carolina. I’ve traveled extensively in the US before moving abroad after grad school. I've lived in South Korea, Malaysia, Thailand & Cambodia. I've visited several more countries. I am a temple tourist of sorts. :) My grandfather was a high level Freemason first in the Elks Lodge, then again for fun, the Moose Lodge. He was also a member of Mensa, although he was forced to earn a living, dropping out of public school after 8th grade. He is registered on the Choctaw Roll. My grandmother (Fuquay "French Acadia"), mother, aunt, & sister are Eastern Stars. I was not set to walk an approved path within a guild so I was harnessed for my gifts for over 40 years. I practiced as a solitary and was accepted to follow the Yantra path by Ajarn Koh of Ayutthaya, Thailand, May 2010. After proving to be a daily dedicated practitioner, I was gratefully set free of the “Masonic Harness” by a Sanskrit shaman at the earth’s new year (April, 2015). Unfettered, my gifts have expounded. I am also a craftswoman in blessings, bindings, healing, amulets & talismans. I follow a Pagan Yantra path. I like to have a shared metaphysical space with my client. Our shared metaphysical space is a large flat rock, about 5 ft in diameter. We are surrounded by the ocean, the waves are lapping gently at the rock's edge. We are enveloped in a soft fine sea-mist. As the cards are laid bare, the mist clears - revealing a brilliant soft warm summer sky to illuminate your reading. As an empath, I am very sensitive to your moods and thoughts. If you are feeling angry & frustrated, it doesn't help the connection between us. It's better to take 5-10 minutes to clear your mind & heart before you call. If you are unhappy, it's OK to express that frustration, but please do so responsibly. Thank you! Thank you again. You're always the bomb!!!! clear and positive and tells it like it is ! SunnyJ of SunPixies From Dixie has been a user of Keen since 2015. 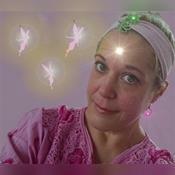 Getting Tarot Readers advice from SunnyJ of SunPixies From Dixie through www.keen.com is safe, secure and confidential.